Ocean Solutions, Earth Solutions includes 16 peer-reviewed papers presented in chapters that showcase the latest and best ocean and coastal science using spatial analysis and GIS. Redlands, California—Ocean Solutions, Earth Solutions, a new book from Esri Press, chronicles how more than 50 ocean and coastal science researchers use geographic information system (GIS) tools and other technologies to study, manage, and protect the ocean and precious marine life. "The mantra of the book is essentially that if the ocean is in crisis, the earth is in crisis," said Esri chief scientist Dawn J. Wright, the book's editor. "The solutions that we devise to help the ocean will be important in helping the entire earth." According to David G. Gallo, director of special projects at the Woods Hole Oceanographic Institution, a healthy global ocean is critical to human health. And keeping the ocean healthy requires scientifically sound management policies. Developing those policies greatly depends on the knowledge gained from analyzing, modeling, visualizing, and sharing observational data that's collected via sensors from ships, satellites, gliders, autonomous undersea vehicles, and other platforms. "All of this data combined, complemented by new GIS analytical and modeling technology and techniques, has provided humanity with a new view of Planet Earth. In doing so, it is becoming easier to recognize and observe the relationship between humanity and the sea," Gallo wrote in the book's foreword. 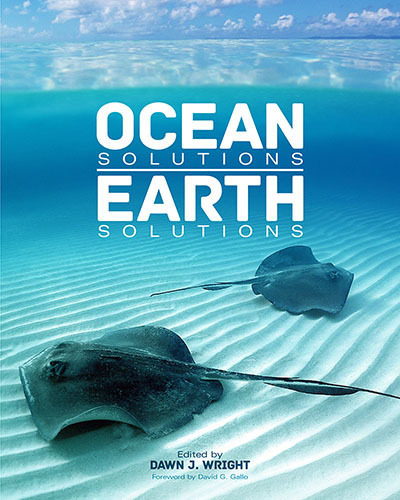 Ocean Solutions, Earth Solutions includes 16 peer-reviewed papers presented in chapters that showcase the latest and best ocean and coastal science using spatial analysis and GIS. For example, one chapter describes how web GIS applications are being used to study Alaskan fisheries, while other chapters focus on the pivotal role that GIS now plays in managing coastal and marine habitat restoration and studying the effect of climate change on the ocean. Other chapters describe web and mobile mapping apps that help scientists and volunteers monitor and map sightings of marine mammals, such as whales; the creation of a GIS tool to calculate a pollutant exposure risk to oceans from treated wastewater and runoff; and the development of a map viewer to manage Archipiélago de Cabrera National Park in the Balearic Islands of Spain. "Our ability to measure change in the ocean is increasing not only because of improved measuring devices and scientific techniques but also because new GIS technology is aiding us in better understanding this dynamic environment," Wright said. The book, aimed at professionals in oceanography and marine science and research as well as students in those fields, includes an extensive digital supplement with datasets, geoprocessing workflows, GIS tools, mobile apps, story maps based on Esri Story Map apps, and Python scripts. Ocean Solutions, Earth Solutions is the first Esri Press book to use digital object identifiers (DOIs) for citation of both the book and supplementary datasets, which is useful for research and global library cataloging purposes. Ocean Solutions, Earth Solutions is available in print (ISBN: 9781589483637, 384 pages, US$59.99) or as an e-book (ISBN: 9781589483651, US$59.99). The book is available at online retailers worldwide, at esri.com/esripress, or by calling 1-800-447-9778. Outside the United States, visit esri.com/esripressorders for complete ordering options, or visit esri.com/distributors to contact your local Esri distributor. Interested retailers can contact Esri Press book distributor Ingram Publisher Services.